About ESC > News > ESC and Spectrum Join Forces! ESC and Spectrum Join Forces! 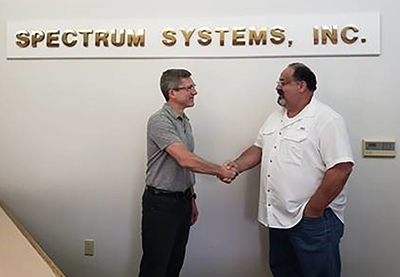 We are pleased to announce that Environmental Systems Corporation (ESC) has acquired Spectrum Systems, Inc. (SSI) headquartered in Pensacola, FL. ESC is the leading CEMS Data Acquisition System (DAS) software provider. Headquartered in Austin, TX, ESC supports industrial and utility plants with air emissions compliance requirements. Spectrum is a respected full-service CEMS provider that delivers high-quality CEMS integration, maintenance, repairs, training, stack testing, and DAS software. What does this mean to you? The industries that we serve are experiencing many challenges, including increasingly complex regulations, plant closures, and workforce retirements. Together, ESC and Spectrum will be stronger and better positioned to meet your evolving compliance needs. Spectrum and ESC share the same values of excellent customer service, team work, industry expertise, and solving complex problems. Our joint mission will be to help you succeed in your job of meeting your company's compliance obligations. For more information about Spectrum Systems and services offered, visit the website here. Review the Press Release 'ESC and Spectrum Systems to Broaden Range of Product and Service Offerings for CEMS and DAS Customers'. If you have any questions about this exciting news and what it will mean for you, please contact any of us at any time. Receive news on articles and resources posted, new features in our software and hardware, company news, plus announcements of upcoming webinars and events.